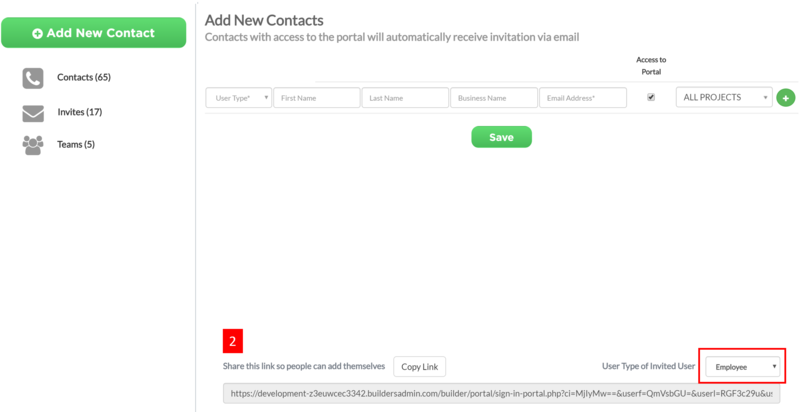 You can easily add contacts to your portal from your projects dashboard. You can either invite contacts to have access to your portal or save contacts with no access to your portal. 1. From your projects dashboard, locate the Contacts panel then click Edit or Add Contacts (if you don't have existing contacts yet). You may also use the Invite button on the project tile. All will display the same contacts modal. 2. Click on the Add New Contacts button. 3. The Add New Contacts tab will be opened. a. Fill out the fields. b. Select the User Type of the contact you want to add. The user type will determine the access of the contact to your portal. c. Check the Access to Portal to give access to the contact to be added. By default, the Access to Portal is checked for contacts with Employee or Manager user type. d. Select the Project/s that you want the contact to have an access to. Note: You can give the contact an access to all your active projects by checking the [ALL PROJECTS] on the drop down menu. e. Click Save when you are done. 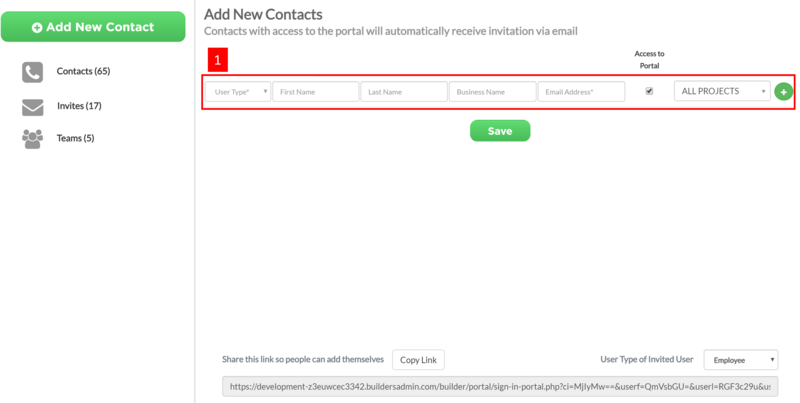 The newly added contact with access to the portal will now be on your contacts list. a. Select the user type of the user you are going to invite. b. Click Copy Link then send it to the user. c. User will fill out the form after opening the link. Adding contacts with no access to your portal saves you time when filling out forms in Small Builders. All your contacts will be used in auto-population of your forms. 4. Remove the check on the Access to Portal to add a contact with no access. 5. Fill out the fields. 6. Select the User Type of the contact you want to add. 7. Click Save when you are done. The newly added contact with no access to the portal will now be on your contacts list.